Getting Bridget to bed every night isn’t an easy task. Between the multiple requests for drinks, more blankets, and to turn the light on, I feel like I barely have a chance to sit down and relax before I hear her call out for Mommy. I know one big issue is that she doesn’t like it too dark. I had been leaving the hall light on, but it’s SO bright. If I turn just the little night light on in the hall, then it’s too dark. I can’t win! When I heard about Dreamz to Go Octo by Cloud b, I thought it would be great for Bridget and hoped it would helped make bedtimes easier. 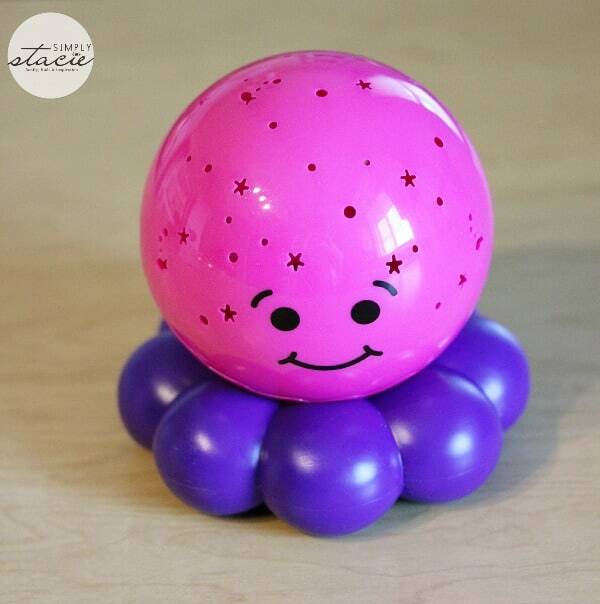 Dreamz to Go Octo is based is part of the dreamy lites collection and is based on the original Twilight Turtle. 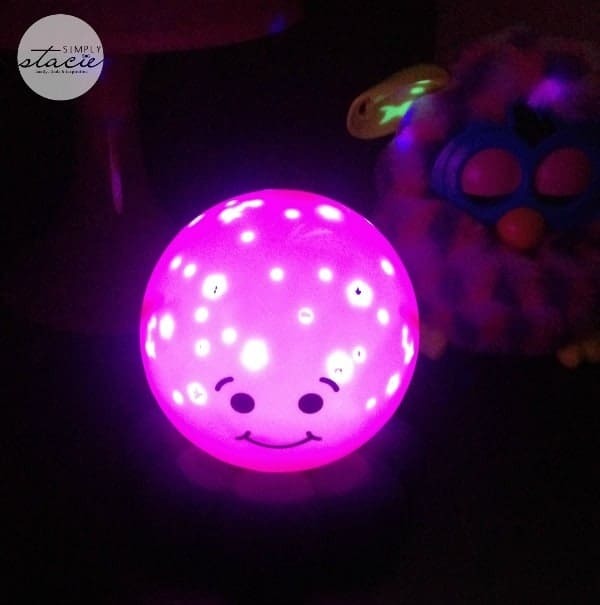 This little guy is an octopus who lights up in two colours and projects stars and fish blowing bubbles as well as illuminating the room in a soft, soothing light to help ease fears of the dark. It features a 45-minute auto shut-off so you don’t have to worry about it staying on all night. Or if you fall asleep and forget to turn it off, it’s no biggie. It turns off on its own. Your child will be asleep (hopefully) by the time it turns off and won’t be aware of the darkness while they are in their deep slumber. 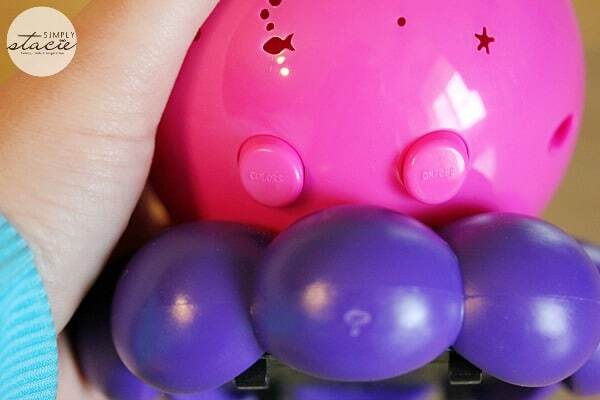 Dreamz to Go Octo comes in two colours: pink and blue. Dreamz to Go Octo Pinkle projects blue and red colours while Dreamz to Go Octo Bluee projects blue and green. It requires 3 AAA batteries which are included so you can get it set up right out of the box! Bridget has her Dreamz to Go Octo on her night stand beside her bed. I turn it on for her at bed time and she likes to pick out which colour it will be. She thought it was the coolest thing to have stars on her ceiling. I think having it there has made bedtime less stressful and she doesn’t get out of her bed that often. There have been nights where I tucked her in and she didn’t call out to me or get out of bed once! I wish all nights were that easy. I’m glad that we tried this product and anything that helps make bed time easier is a good thing in my books! 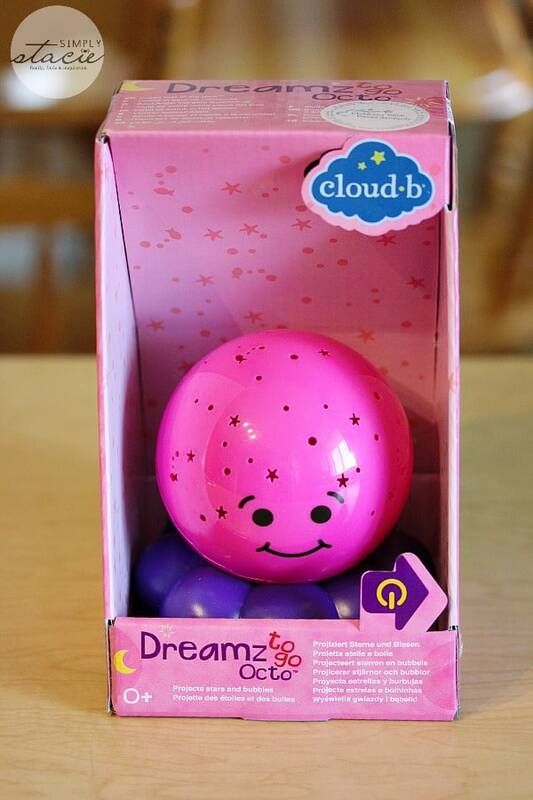 Cloud b Dreamz to Go Octo is recommended for ages 0+ and has an SRP of $24.99. You can find them at independent toy, gift and baby stores across Canada. My good friend’s little girl! this would be for my newborn due in four weeks. This would go in my sons room if I won. my son, he would love it! I would give this to my Grandaughter who is afraid of the dark! 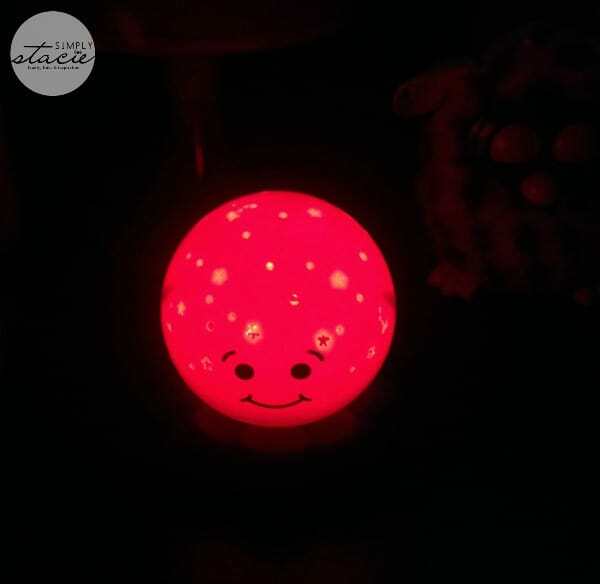 I would give this very cute “nightlight” to my little great granddaughter. I would give it to my youngest daughter! My daughter for her children to use. I would give it to my nephew, Liam, who was born this Nov. 14 th !! I would love this for my daughter’s room! My son would love this in his room ! If I win I would give this to my granddaughter. My friend is having a baby in the spring. This would be part of the baby’s gifts. i would love to get one in blue for my son. It would go in the room that my 4 and almost 3 year old boys share! I would give this to my little niece. I’m having a baby in about a month and so I think I’d keep this one for them. My daughter! I’d love to give this to her for Christmas. it is such a cute gift. My lo would love this , so he would be getting it for sure . Thanks for chance .